S.B. 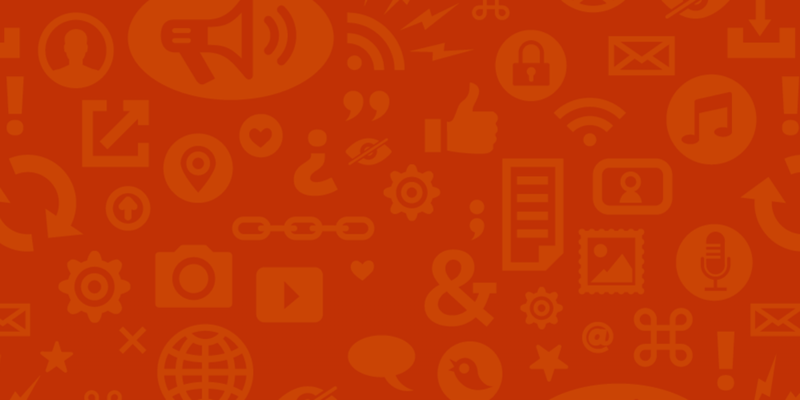 822, Senator Scott Wiener’s net neutrality bill, is currently pending in the California legislature. It’s a bill that prioritizes consumers over large ISPs, creating strong net neutrality protections. Unsurprisingly, AT&T and the rest of the giant telecom companies don’t like it. And unfortunately for Californians, the report on the bill issued by the California Senate Committee on Energy, Utilities, and Communications parrots several misleading arguments by the large ISPs. S.B. 822 does a lot of things, but the biggest objections AT&T has—and which the committee seems to be comfortable agreeing with—are with provisions that cut into their bottom line. S.B. 822 bans blocking, throttling, and paid prioritization for any ISP looking to get money from the state. ISPs want paid prioritization because it would let them charge companies extra for faster connections. ISPs argue that if they can’t make more money that way, they’ll have to charge customers more. ISPs also want to be given taxpayer money without these requirements. The committee’s recommendations play right into the ISPs’ hands, even though they don’t make sense. The foundational argument within the Committee’s analysis against many of the provisions that protect net neutrality is the premise that if ISPs can’t charge more parties extra, all of us will need to pay more for broadband. And while it is a fair assumption that ISPs would love to jack up the prices even more, it is not true that ISPs are drowning in debt and need the money from the new revenue streams opened up by the repeal of the FCC’s net neutrality and privacy provisions. ISPs are not hurting for profit. 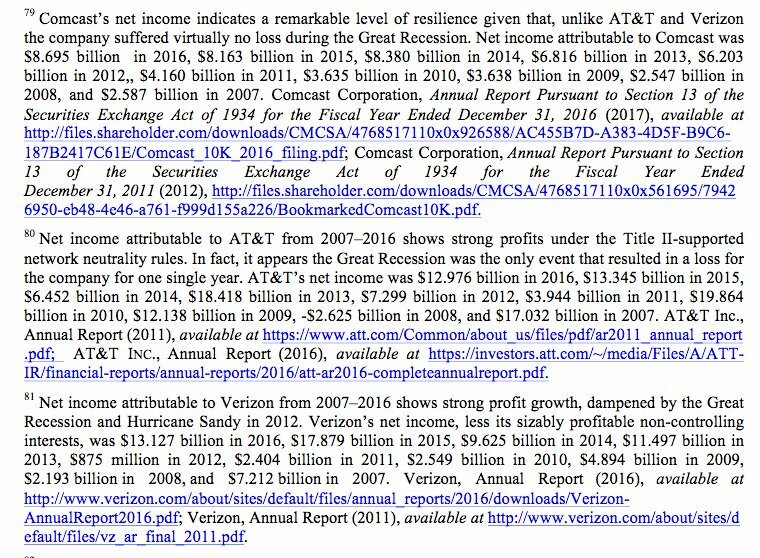 In fact, large ISPs like Comcast, AT&T, and Verizon have made billions in profits for the last ten years (according to public information EFF assembled), and have been so incredibly resilient that only hurricanes and the Great Recession put a dent in their margins. In fact, when you look at markets with competitive entry either from community broadband or alternatives to the cable industry you find low prices and 21st Century gigabit fiber infrastructure. Small ISPs like Sonic can sell gigabit broadband at $40 a month, cities with medium size populations like Chattanooga are able to self-provision (and make profit) and deploy gigabit broadband at $70 a month, Google Fiber was able to sell gigabit broadband at $70 a month as well in Orange County, California, and San Francisco’s proposed community broadband project estimates it can deliver high-speed broadband for low-income people at around $30 a month. So how is it that these companies and local governments can provide 21st-century internet at an affordable price, while huge ISPs rake in billions per quarter charging high prices, yet policymakers in Sacramento think ISPs are in deep need of charging more for Internet access to upgrade? Perhaps they missed the reporting that revealed ISPs immediately moving to raise prices after network neutrality was repealed, but nothing indicates that having network neutrality rules will result in people paying more for Internet access. The problem isn’t that ISPs can’t afford to give us better service, it’s that we lack competition in the high-speed Internet access market and ISPs are not restrained from raising broadband prices. Network neutrality just ensures they can’t also use their gatekeeper power to stop competitive alternatives (particularly in the video market) from getting to broadband users. Zero-rating is the process where ISPs exempt certain content from counting against your data cap. The problem EFF has been seeing with zero-rating practices is that the ISP has a huge incentive to exempt their own content while keeping competitors under the cap. When faced with content that doesn’t count towards the cap versus better content that does, people will likely settle for the zero-rated content. The committee’s analysis acknowledges that the FCC was going to look at zero-rating practices on a case-by-case basis and then recommends that the state not look into zero-rating practices. Notably absent from the analysis are the FCC (under Chairman Wheeler) concerns about serious consumer harms regarding current zero-rating practices (particularly from AT&T). Those concerns didn’t change, but the FCC did. It is very likely that the zero-rating practices as engaged by AT&T and Verizon were going to be found in violation of the 2015 Open Internet Order’s ban on data discrimination. That is, the ban on ISPs treating In late 2016, near the end of the Obama Administration, the FCC issued a detailed analysis and expressed serious concerns that both companies were probably violating network neutrality. However, one of the first acts by President Trump’s new FCC Chairman Ajit Pai was to terminate all investigations into the conduct of AT&T and Verizon and rescind the legal findings the FCC made on zero-rating. Nothing in the history of zero-rating practices indicates that ISPs exempt content from data caps in order to benefit the consumer. Without fail, the ISPs have chosen winners and losers (very often choosing their own vertically integrated services) because the value and incentive to do so is too great to resist. According to the CTIA’s own study, 84% of consumers look more favorably on zero-rated data and are more willing to consume zero-rated content. That means that even if the content is better, it may not succeed the way zero-rated content does, just because a consumer might avoid something that will count against their data cap. Instead of taking all of these facts into account, the California committee’s report trots out the tired ISP talking point that zero-rating is good for low-income users despite the fact that customers' overall monthly bill remains unchanged (and has never gone down in real dollars). The last favor to the big ISPs the committee gives is to gut S.B 822’s requirement that taxpayer subsidies that go to ISPs (including AT&T) be conditioned on network neutrality. The bill as it’s currently written makes receiving taxpayer money dependent on adhering to net neutrality principles. Today, California spends $100s of millions on ISPs, including AT&T, as part of its California broadband subsidy program to help expand broadband deployment so that underserved communities finally get broadband access. The Committee expresses concerns that ISPs will decline the money and not build broadband networks with it because they do not want to be required to operate under network neutrality. These exact same “concerns” were expressed in 2009 by AT&T when Congress created the $4.4 billion broadband grant program as part of the American Recovery and Reinvestment Act and the Obama Administration decided to condition federal broadband subsidies to require network neutrality. But guess what? More than 2,000 companies applied for subsidies to build broadband with projects that were ready to deploy that very year. Without a doubt, even if AT&T decided to not take the subsidies, there will be alternative companies ready to move in and accept the state’s investment. But despite what history has shown us, the Committee appears in ready agreement with AT&T on being concerned about asking too much of them while handing them taxpayer money. It's a shame that the Committee on Energy, Utilities, and Communications hasn’t seized on the chance to make California a leader in net neutrality and instead authored a report that looks like the telecom lobby wrote it. But this is only the report, the actual committee hearing is tomorrow and it will be broadcast on the Internet. That means there’s still time to tell the committee members to support the bill with its net neutrality protections intact and not accept this sham analysis.